Artists, architects and even at-home crafters, whether you are interested in sewing or stamping, can benefit from a drafting table desk. There are many different desks to choose from that are perfect for offices and studios or just a craft corner in your home. There are many drafting tables that are suited for students and professionals alike. Some desks are made with certain people in mind and it is important to find the table that is right for you and your needs. Two-legged and four-legged tables have different properties and an artists' desk often has a greater tilt than other tables. There are also light tables that can illuminate your project from below and portable tables you can take anywhere. 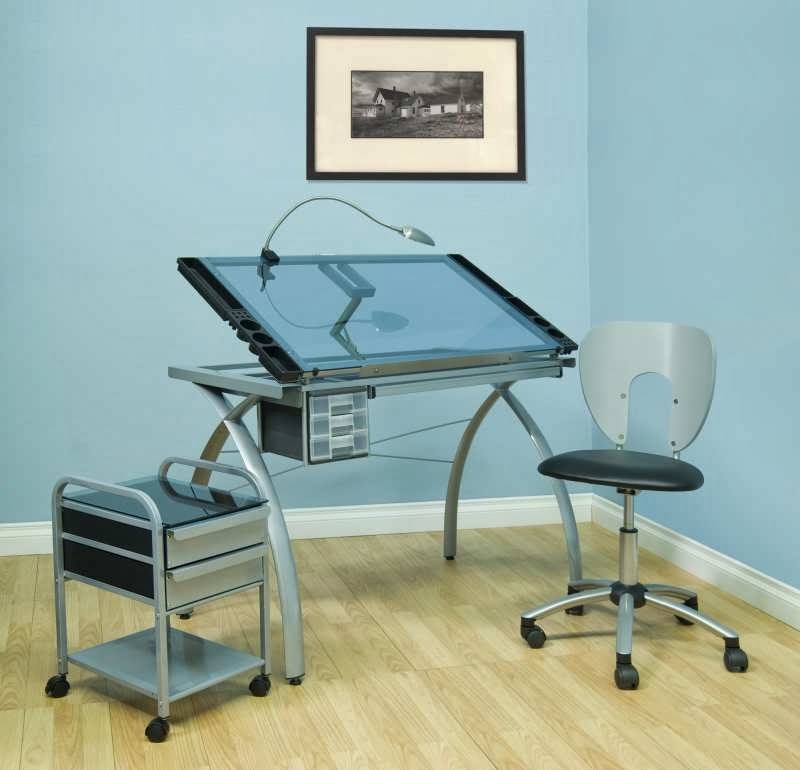 Professional drafting tables are extra-sturdy and are intended to last for years to come. They are great for engineers, architects, and of course drafters as well as artists. Professional tables come in either two-legged and four-legged styles with or without storage desk drawers. They also come with a variety of tilt options. Artist drafting table desks for both students and professionals have tilts allowing them to be set up like easels. They can be used to create both horizontal and vertical work spaces. These special tilt tables are often two-legged in order to allow the full ninety-degree adjustment option. Glass top drafting desks are a great addition to a modern office. They are both stylish and functional. They are suitable for any type of drafting as well as crafting. The glass is tempered safety glass, so it is extremely durable. Many can be modified to be light tables as well. Standard light tables have plexiglass tops and allow for tilts up to forty degrees. The best light table lamps are daylight lamps, which are color-correct for the best lighting conditions. Some drafting tables today are made specifically for arts and crafts enthusiasts. They often have ample storage and can make a great hobby station. They typically come with some tilt options as well as adjustable table heights. Traditional hobby tables have a wooden top with a metal base, but there are also glass top models available. They can provide a unique contemporary look to your craft room. In addition to many storage options, some of these drafting tables also come with side trays to store art or other supplies. Folding, lightweight drafting desks are excellent for both adults and children. They are collapsible for easy storage or transport. There are many other types of drafting desks. It is also possible to buy a drafting table desk and chair set, ensuring that the components match in order to keep your crafting or office space looking stylish. Drafting tables made of wood can have both contemporary and traditional styles to compliment your studio however you like. There are also handicap accessible tables that have cutouts to make it easier for individuals in wheelchairs to maneuver. They also have convenient raised edges to stop items from rolling off. No matter your needs you can find a drafting table that will suit you.